All received and looking good. Thanks for all your support in turning this around so quickly! The printing looks great! Thanks for doing such a good job. Just wanted to thank you for our posters and your patience with the order. They look great and we’re excited to start using them! Thank you to the Print Angels for their help with producing some flyers for a local fundraiser. The service was second to none and the flyers were ready within a few days. I will definitely be using their services again soon! I just wanted to say a huge thank you for my order, it has just arrived and I’m so pleased with them! They look better than expected and arrived sooner than expected so you can’t get better than that! The service and experience was fantastic, make my life really easy when I order from you guys! I can’t think of anything you could improve, you’re all doing a great job! Love my business cards , you do everything so lovely! I was very excited to open the beautiful promo material that I received from Essential Print Services last week. I love the desk pad….the robot is very cute. Really beautifully packaged. Thank you. Excellent service, excellent printing, excellent delivery, a hat trick. Delighted to find our stationery delivered gift wrapped, and a yummy packet of jelly beans, which I don’t share. Picked up our new recipe cards this morning for the clubs. Thank you Essential Print Services! Love your service, which is why I come back. Happy customer. Thanks so much for sorting out the merchandise for us! I have just opened them all and I’m really pleased with how everything has turned out. “A huge thank you to Pamela and Yvonne for beautifully creating my new branding and producing the finished articles to such a high standard. They had their first outing at a networking event today. I loved it, I felt it was really me and I have had since awesome comments. The flyers look really great! We have now received our order from Essential Print Services and it all looks fantastic! The folded sheets will be a great tool in our marketing war chest and we are very excited to use them! Many thanks again to Katie and the team, and we will be back for more print works we may require in the future. We have received so much positive feedback about the graphics that you provided. Everyone commented how professional they look and how good the printing is. Thank you for your time and patience. We are thrilled with your service and your product, and for the speed with which you produced the brochure. Von was incredibly helpful in helping to make it look as it good as it does and went the extra mile and further. Thank you so much. You can be sure that we will be back. Service is always slick. I can’t think how it could be improved upon. I always enjoy the bag of jellybeans so maybe an XL bag next time? Your people did an excellent job. I was having the same job done at the same time by a private design firm elsewhere to ensure that I would end up with something I could use. I had a pressing deadline to get an important job application submitted. In the end, the design firm charged four times as much, demanded far more input on my part and produced work that was far too heavy-handed and design-conscious. The product you supplied was far superior and far less trouble. Top marks – and when the time comes to produce a four-page print version plus business cards, I’ll be using you again. What brilliant customer service and attention to detail – Thanks Yvonne! Very difficult to give any suggestions on how the service can be improved as it has been first rate throughout. Fast, friendly and efficient. Thank you to Katie and the Essential Print team for steering me in the right direction and creating a professional, consistent and eye-catching methods to promote my business. Your patience with my ever-changing mind was very much appreciated. Thank you! Although we haven’t actually printed anything with Essential as of yet, I would like to ensure Katie’s outstanding customer service does not go unnoticed! We have messed her around so much with delays in design, and changes .etc but she has been so professional and helpful throughout the entire process! We are getting, rapidly, to a stage now where we are ready to print our work, and I’m sure the quality of the prints will be spot on! Thanks guys, great work! Thank you to Yvonne and her team at Essential Print Services, for helping Rainbow’s End Forge at Shardlow sort out the headaches with their artwork and for a speedy, seamless delivery of the finished product. An added bonus was the quality of the complimentary jelly beans! Great service from Yvonne at Essential Print Services. The quality and finish of my new business cards and flyers is superb. Highly recommended and will definitely be using Essential Print Services in the future. The Jelly Beans were a nice touch too! Katie and the team pulled it out of the bag for me yet again! The service, quality and the amazing checklist they do for any printed piece (saved my bacon this time) makes Essential Print Services the best printer around. You can definitely rely on them. I just wanted to express my sincere thanks to you personally for the design of the business cards and how professional they look. It really reflects the type of establishment we are….. they are fantastic. Your service has been excellent…and your high level of patience with our client has been exceptional! It has been a lot of work for a small initial order! Hopefully the repeat orders will be a lot less work from now on. Thank you to your team for the help you have given us! I can honestly say that the service we received was exceptional. We had a last minute request just before the Christmas Break which was critical to a project we were working on at Derby Station, and instead of turning us away and saying you couldn’t help us, you managed to turn our prints around within 24hrs. Both of the contacts I dealt with during this transaction were knowledgeable, personable and very helpful, and the level of communication between us was also very good, especially considering I was having issues with receiving emails at the time. Thank you again for all your team’s help in fulfilling our order. It was very much appreciated. At Virtual PA Derby, as an admin loving, time saving specialist, I am focused on giving businesses back time, so that they can focus on the things that they want to be doing, rather than things they feel they have to do, and I include myself in this! I had spent some time looking for a promotional item that I could use as a giveaway at a networking event I was presenting at, and had tried, unsuccessfully, to find something that represented my business, so I contacted the Print Evangelist herself to see if she could help and I was not disappointed!! Yvonne took the time to understand my business, and the message I was wanting to portray in my giveaway and came up with the idea of a Take A Break Kit Kat mailer, which would contain information about my business. I thought this was a fantastic idea, and who doesn’t like free chocolate!! The service I received from Yvonne and her Print Angels was second to none, nothing was too much trouble and emails were responded to very quickly. However what I was extremely impressed with, was how they were able to turn these around with just 2 days notice so that they were ready in plenty of time for my presentation. So, if you are looking for a Printer who cares about their customers; who go the extra mile, and who can turn things around very quickly, sometimes even the same day, then look no further than Essential Print Services (Derby) Ltd as you won’t be disappointed! In fact I have, and will continue, to recommend Yvonne and her team to anybody wanting quality printing. Thank you very much Essential Print Services (Derby) Ltd, for all your help, I will definitely be using you for all my future printing requirements! Thanks for our fantastic new pens they look lovely and write like a dream! Exceptional service. Our first time using this company and cannot express how pleased we were. Ours was a ‘panic’ order but they undertook the project with no fuss, produced an example for our approval in very quick time and the goods were printed excactly to schedule. As a disabled person I was grateful for their help in loading my car. Many thanks and will definately use again. A big thank you to the Print Angels for their sterling work on our recent print jobs. Excellent, speedy service and well priced too! You guys were perfect! could not ask for a more friendly customer focused business. Katie is very good. Beautiful new business cards. Thank you, fantastic service as always. Fabulous friendly service, with great communication all of the way. This was my first printing requirement and you made the experience so easy. I’ll no doubt be back for more. Thanks. No suggestions needed, we were really pleased with the quality of our flyers from you. Service and communication with Katie was great, and the little jelly beans were a lovely touch! We love the cards, the quality is brilliant and of course the service was too. I honestly can’t think of anything to suggest to improve the service – from start to finish it was great. We will definitely use you again! We received our prints earlier today and I would just like to thank you and your team for your hard work with these and for delivering them on time, even though we asked you at very short notice! You (Katie) are a credit to Essential Prints and the rest of the team are amazing too. I just wanted to pass on my thanks to you and your team for all your help and getting the flyers to us ahead of schedule. They look great and we’re really pleased with the quality. At Code 56, as IT Specialists, we’re generally logical & focused on finding solutions to technical problems. We *can* be creative, but in a very technical way. That’s why we need a team like the Print Evangelists at Essential Print Services behind us. Every time we’ve ordered something to be printed, be it letterheads, business cards, roll up banners, vinyl stickers or window graphics our experience with the Essential Print team has been fantastic. Right from the initial conversations through to the delivery to our Derby office the team are a pleasure to work with. The team are incredibly responsive & I genuinely feel they truly care about what they are producing. It doesn’t take long to tell that they are all genuinely passionate about printing, and that’s what we look for in our suppliers. Experience tells us that people who are passionate about what they do, will not do a bad job. In fact, they tend to set the bar higher and rarely deliver “average”. Simply put, Essential Print Services are my go-to people for anything print & promotional related. I’d like to thank Essential Print Services for all the technical help they gave me, which was invaluable and instrumental in producing my very first book. They listened in a calm and patient way and immediately put me at ease. I am more than delighted with the work they carried out for me. Thanks so much for the gift vouchers, they look amazing. Can’t wait to start handing these out! I cannot recommend these guys enough. All I wanted was a few business cards. Who would have thought that someone could actually get you excited about a bit of paper and some ink?! Well Yvonne and her Print Angels can do just that! Essential Print Services are living proof that passion and creativity are a winning combination. Just to let you know we have received the stationery and thank you for a professional, efficient and prompt service. Could you pass on my thanks to Lee for the time extended to myself and Jo and the quality of his design work. I have just returned from holiday and have looked at my party invitations. I wanted to thank you for doing such a fantastic job of these. They are brilliant and have been well received. Great and friendly service, my business cards were superb quality and ready before the date quoted. I wouldn’t hesitate to recommend Yvonne and her team. *Update! Just had some more work done, same great service and price, love using Essential Print, they always go out of their way to recommend the best solution to me. I love essential Print! Great prices and a real personal service that works with me to ensure I get the best solution for all my printing and promotional needs. I received my A4 brochures yesterday and I just wanted to say what a fantastic job Lee and Katie have done, everyone is really impressed. You guys really understand our branding and the feel we are trying to get across to our customers. Appreciate all the help!! Thank you for our Wolf Hut customer loyalty cards! Excellent service, top quality. We love them and we’re sure our customers will too! Just wanted to say a massive thank you for the printing – it is fantastic and the booklets especially were a hit with the team! We’re really pleased with the banner – it looks great. Thanks very much for your help. So much more than a print service! Yvonne took the time to understand my business and listen to my ideas and vision. She was able to advance my thinking and suggest ways of making those ideas a reality. I also loved that she confidently challenged my thinking when she knew I was on the wrong path (when my idea was a bit rubbish!) I am delighted with the result of our first project together and I just know that The Wolf Hut customers are going to love their new loyalty card! Great experience, I highly recommend Yvonne and the team at Essential Print Services! Just had a great package arrive from Essential Print Services (Derby) Ltd. What a lovely Doodle book and looks like such a fab inspirational organisation! I never thought print services were interesting! I thought the mini comp slip card was brill! Thank you Yvonne Gorman and her team! The programmes looked great and you were so helpful at all time from quotation to collection of the finished programmes. We really appreciate all of your efforts. We really love the pop up banners we had delivered yesterday. They look really great and everyone here has commented how good they look in our foyer area! The quality of the cards is really good and I was pleased how well you and your colleagues expedited my order. I work part-time for two organisations so will certainly recommend Essential Print Services if, and when, printing services are required. The pens look awesome. Very happy with them! Thanks! I’m very happy with the wallets, Thanks again. Thanks again for the order they are really are great and just what we wanted. I would also like to say how professional and polite everyone has been and can’t recommend the company enough. I wanted to say many thanks for printing and delivering the packs and the leaflet – I think you’ve done a fantastic job! I was surprised with the quality of the material as I expected it to be quite thin, but it’s thicker and much better quality than I anticipated. Will definitely use you again! Just wanted to say the quality and printing of the other 5 banners is fabulous!!! We’ve had so much problem in previous years with other companies, which ruined our brand! Thanks! A great message came with our new notepads from Essential Print Services this morning. Thanks folks – we love them. Loving our new t-shirts too thanks guys – crackin job! We put out a plea for help on linkedin for some branded promotional items and Yvonne from Essential Print Services was recommended. The customer service, value and quality of the items have been faultless and we’re delighted with the notepads we ordered. Our expectations were completely exceeded and we will be using them again very soon! Great job print angels, thank you! The brochures looked great. Printing tight and clean. The paper has a lovely feel. Thanks again for helping us get this sorted and for the great quality products. Yvonne & her team did an excellent job of producing and turning around an important job for me really quickly which was just what I needed. I had no hesitation is placing more orders with them for the same exceptional service. Just a huge thanks for the prompt service, looks great. Just a brief thank you – business cards arrived on time – great job everyone. High-quality products and service, way above the rest! We would strongly recommend them to any business (plus you get jelly beans!). Hi, only just had chance to stop and look at the business cards properly love them. And the jelly beans where a nice touch, they came in very handy as I’m starving thank you very much. Looking forward to seeing my price list. We have been using Essential Print for over 5 years and they have always been exceptional in terms of print and customer service. I would recommend them to anyone who needs any printing, no matter how small the order the team make you feel valued and provide the same high standards. Thanks Von; Lindsay has just dropped it off and it’s up in the window! It makes it feel a lot more like an IT office office now 🙂 Also, thank you very much for another pen & some sweets (posh ones as well! ); the way you do branding really is inspiring. I just wanted to thank you and your team, especially Katie, for the assistance you have given me this last month or so. Have a great Christmas and a Happy New Year. I look forward to working with you in 2017. The cards are excellent, thank you very much to the whole team! Happy Christmas to you all. Just wanted to let you know the feedback for my calendars are fantastic and people are loving the quality of them. I have even had a couple of customers say they are better quality than the BBC country file calendar. So a big thankyou. And looking forward to next years! Well done once again for providing excellent service! The Print Angels came through with the right paper at the last minute and found that a correction was in order. Great price and 100% on service. This is Print Angels at work! Highly recommended. It’s not often in life that the end result exceeds your expectation, but that has certainly been the case with this project. This double layer reverse print vinyl gives the right effect to match the original 1976 screen print on glass. Very many thanks to everyone at Essential Print Services for a top quality job! Excellent communication and a great quality finished product. Excellent all round! Thank you for delivering the calendars so quickly. We have had a look at them and they look great! Thanks again to you and the team for your hard work on these. Thank you so much for the bookmarks you made in a short amount of time for our family in memory of our Grandad. It was something we all took away with us, with a feeling that he is always with us. You were very compassionate and understood the importance of why we needed it the next day. I don’t know of any other company that would provide such an amazing service. Everyone has commented on how professional the bookmarks look. Thanks again. It has just arrived … and they are beautiful .. thank you! Just wanted to say a huge thank you to you both and the whole team for pulling together our marketing literature for us last week. We’re really impressed with the brochures, cards and notepads, they’re just what we wanted! Also, the jelly beans always go down a treat! THANK YOU for my new cards. They look fantastic! We have used Essential Print since we started our business back in 2010 and have never felt the need to go anywhere else. The Essential Print team are always so friendly, quick to respond to emails and on several occasions have helped us out on some last minute projects. We really love how the team understand how our print needs are important to our business and offer ideas for new and exciting ideas to make us stand out. We have recommend Essential Print to several of our clients and the print angels have always done us proud. There is always a scramble for the jelly beans when the latest order arrives! Thank you for the flyers, we’re very happy with them. Brilliant service from you and your team. I honestly don’t think you could do anything to improve. Lindsey helped me throughout the whole process and turned around an extremely tight deadline. I was very happy. Everything was great, the posters were as I expected. I only wish I could have the same level of service in East Europe with printing companies. Your service/ product was 100% as per usual. It is more than likely, I shall have additional business for you in the future – until then! THE NEW UNIFORMS ARE HERE AND WE ARE SO HAPPY OOOOO SOOOOO GOOOOD, SO HAPPY. Flyers looked great. Thanks very much for the good job. The Service that we received was first class and the leaflets are of a very high quality. Thank you soooooo much for the flyers, they are absolutely amazing!! I’m so happy and feel happy to hand it over to clients. Had so many compliments from clients today!!! I received the banner yesterday and sooo delighted! Looks fabulous – and the image is so striking I can’t express how happy I am. I am also going to use the booklet you send out – love all the little gifts that come with the print. Our gift voucher holders arrived yesterday, they look great, thanks again for your help with these, hopefully we’ll be in touch with you again sooner rather than later for more! What an outstanding printing company. I, like many of us have been very wary of print suppliers in the past, due to not knowing anything about paper weights, costs, backgrounds etc etc. The team at Essential Print are exceptional! Yvonne is inspirational, and has helped me no end with advice on my new literature. It was delivered in such a way that made my literature feel special. A unique company that comes highly recommended by me!! We were so pleased with the Christmas calendars that you are first on our list now! We’ve had a lot of great feedback on them. Many thanks for our print. We are really pleased with it. I’ve also recommended you to work, as I think the print is excellent & very professional. The document looked great. The team working on it were really pleased, thanks once again. I just wanted to thank you for all of your hard work. The leaflet looked amazing! Thank you for the Jellybeans too! Just wanted to say thanks again for our beautiful booklets, they have gone down a treat here in the office. Feedback from my colleagues for you: “this is one of the loveliest things I’ve ever seen :)” “This looks absolutely brilliant.” Thanks ever so much for this, we are very pleased. Customer service couldn’t have been better, and neither could my prints! I won’t be using anyone else from now on! After I had a pull-up banner and a company brochure designed I needed to find a printer. I contacted Essential Print Services for a quote and she came back to me within an hour with a competitive price for each. I therefore went ahead with the order and sent my artwork. The team have a brilliant attitude to customer service and a real focus on the quality of their work. Many thanks everyone at Essential Print Services for a great job. I will definitely be using you for my print needs in the future. Just like to say a big Thank You, we have received our banners put them up at our meetings tonight to show all the leaders and girls and they are ace. Thanks for everything. Received the brochures today! I am delighted. They are fantastic and I can’t wait to give them out to prospective parents. Thanks so much. Exceptional service and friendly staff. I am delighted with my print, it’s exactly what I asked for. Will be using Essential Print in the future and recommending to friends. Thank you! Just to say a big thank you to you and your team. We are all really pleased with the calendars, even better than expected. Thank you for your prompt service and attention – refreshing to get such in today’s world! A knock at the door! Someone dressed in red with parcels! No surely not…not THIS early! I just wanted to thank you once again for all your patience in getting my idea into a format that would look great. I have now taken it to the team to see them and they all agree with me WOW they’re awesome and so the look that I want for our new business venture and they really compliment our other business too. So once again thank you so much for your excellent service from start to finish. Thank you for the Christmas Cards. A fantastic job as always. A BIG thank you for the Christmas Cards, they are fab. The Lanyards look totally fab, thank you so much for supplying them! Your friendly, local print provider. Always going above and beyond to help us have the best start possible. Thank you Essential Print. After being let down by another company I was passed Essential Print Services’ details to try. The service was superb, they got me out of a hole and my print run done in time for the event. Friendly, understanding and willing to go the extra mile. Absolutely fabulous to deal with I cannot recommend highly enough!!!! Just to say the tickets arrived and they are great. Thanks for your help and patience too! Just wanted to say thanks so much for getting the brochure printed within such a short timeframe, and for a fantastic print job – it looks brilliant! Such high quality products and a wonderfully personal service. Working with Yvonne has been a real pleasure, she is patient beyond belief! Thank you very much indeed for all your help! Without any doubt, THE best company I’ve ever dealt with. Brilliant quality, fantastic customer service and very competitively priced. Emails always promptly and politely answered, nothing is too much trouble. Why can’t all business’s operate like this? I’ve just taken delivery of a pop-up advertising stand. The print Angels were friendly, approachable, client focused and very professional in helping me to get this right. Would highly recommend. Thank you Laura, Kat and Yvonne. I didn’t just pick the first company I wanted to do my business cards and brochure design, I looked around and as soon as I saw the reviews for Essential Print Services (Derby) Ltd I knew I was making the right choice. Yvonne Kat and Laura market themselves as Print Angels. I did wonder if I was worthy! I am delighted to say that I have used them for two projects so far and I can only say that they are the best. They ensure everything is to your satisfaction and they deliver on time and to the highest quality. If that wasn’t enough in this competitive world they are also lovely people to deal with too. Do not even bother looking around, just go the best one for miles, ~Essential Print Services~! Just received the map at the office, it looks absolutely amazing! We are so thrilled with everything especially the high standard of the finish. Thank you once again for all yours and the designers help, absolutely fantastic service. We have received the leaflets and banners and we’re really pleased with them! We’ll hopefully be using one of the new banners on Sunday at the Jenson Button Triathlon too, so they should look good attached to one of the fences. Thank you as well for the doodle book and things – I love the colouring pencil. Don’t think I’ve seen one since I was at primary school! I just want to say thank you for all your efforts with the invites. This was my first personal project using a company rather than through work, so thanks for your patience with me. The invites look absolutely brilliant and I’m really, really pleased with them, and your professionalism. Thanks again, and I look forward to working with you again when it comes to the rest of the print work we will need! Thanks so much for all your help, hard work and patience on this project. You continue to provide an excellent service, of which we are proud to use. Just want to give you a quick update on the KitKat (printed) campaign. They have all been posted to clients and we have had loads of really good response and reaction. We are getting phone calls and emails saying thank you and asking to arrange meetings. MARKETING WORKS. You’re all fab. Thank you! I couldn’t have been more pleased with the service and the product. Yours is a company with nice people, doing a good job. Don’t change! We received the golf brush and markers. They look perfect. Many thanks for your help with them. Thank you for the cards and hand delivering them, much appreciated! The design looks great and my sister was very happy, she’s excited to start networking and start handing them out. Thank you for everything you have done and designed so far. I absolutely love the ‘look’ you have created for me and am very very grateful. The few people that have seen the business cards so far have made really great comments. I can’t stop thinking about new things for you to make for me! I would like to let you know that we all think that the flyers are beautiful! Thank you so much. I also loved the gift of the DoodleBook, pen and the jelly beans. The book will be filled with happy thoughts. I just wanted to say thank you very much for the service and delivery of an excellent product and for the special touches with the delivery. I would highly recommend you to anyone. Absolutely fantastic company to work with, always helpful and friendly and cannot do enough to support you with your project! Thank you so much. 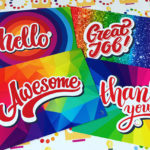 From the 12-Point checks to the delivery with Jelly Beans, Essential Print are one of the only printer providers we know that has the right balance between great prices and awesome quality. So for that extra care for your print, it’s essential to go to Essential Print Services! Brilliant service, great ideas, quality produces. Would definitely recommend. The Angels sorted us out some flyers when we were in need. Not only was the quality great, but the communication was smashing, the ongoing updates were brilliant and as Laura even delivered them herself! When it comes to print, the team at EPS make life easier. Thanks gang. I just wanted to say a huge thank you on behalf of the team here for the business cards. We are more than happy with the business cards. The quality and colours are absolutely brilliant, and this now means the ‘business card saga’ is now over. We have been trying to find a decent business card supplier for months and months, having various samples as you saw in our meeting. Your professionalism, knowledge and consultative approach has been fantastic and just wanted to say a huge thank you. We feel like we have learnt so much from you in terms of the quality, colour make up etc. Love the invites, thank you so much! We received these today and they look great! Thank you again for your prompt service, and the jelly beans! Thank you so much for the poster, it is fantastic! I’m sure we’ll be ordering something else soon enough. Wanted to thank you for your help and service! The cards were awesome! Everyone loved them. I will definitely be printing some more from you. The table plans are fantastic! Thank you and the team so much! I really appreciate your help. The banner arrived safely and looks great! Thanks so much, really pleased with it. And the jelly beans went down a treat too! My magnetic van signage is absolutely amazing. Everybody I have worked for has commented on how much of a great improvement they are. Thanks guys you are legends, I will be back in a couple of months for my next idea. We have the business cards and they look great – many thanks. Love the jelly beans too! The cards look great! Thanks again for all your help. It’s been much appreciated. Thank you for doing the letterheads so quickly! Quite frankly the team at Essential Print Services ‘Rock’. They have been so helpful and supportive with my new venture. I am so, so pleased with the products they have provided; the quality is amazing, just perfect! I’m so proud to be handing out my business cards and leaflets!! Nothing was too much trouble, from design to production, everything was greeted with a smile and such a smooth process. Yvonne is a wonderful lady who has such a friendly and warm personality. No wonder the team are so fabulous!! Just to say thanks for the invites. They look brill. I am well impressed. The flyers arrived today and they look gorgeous! Thank you so much for your help, you have been terrific to work with! Thank you for all your help, as always you make it extremely easy! EPS are my “go to” print team! Amazingly friendly people, great to work with and very accommodating. Love that they are local to me and couldn’t even pluck a bad word from my mind. As far as print results go, brilliant, I took my idea to them, asked for what I thought I wanted, EPS suggested a solution and the final outcome was superb. The boards look fab and are now taking pride of place outside our garage. Thanks for the great work done and see you soon. I have just received our Christmas cards – they’re fabulous! Thank you so much for your help with this! And thank you for the little gifts! I will definitely be in touch for any future projects. Thank you and Happy Thursday to you all. You and your Print Angels have been our best business discovery of the year. We would like to thank you for providing such a great and personalised service and we hope to continue with this new business relationship in the future. I can’t recommend Laura highly enough for her exemplary customer service; helpfulness; attention to detail; and professionalism. So far, Essential Print has delivered an excellent print service, and it is refreshing to have such a reliable and high quality supplier. I’ve returned, and the box of goodies has arrived! They look brilliant – so pleased with them, and they are winging their way out to our clients as of this evening. Please pass on my thanks to your team who have done a fantastic job, and to a tight deadline. Thanks very much. I appreciate your service and quality of work. Brilliant. Just wanted to say a massive thanks for the thank you cards, which were duly received yesterday, and about a third written last night. Love them! Thank you for all of your effort and hard work in making our wedding stationary, it was all perfect, and couldn’t have wanted it to be any better. Amazing professionalism start to finish. Yvonne managed to turn around a very large order in no time at all and even delivered them by hand. Would have no hesitation in recommending this fantastic print business. Blooming fab bunch! Just had some business cards printed by them with the shiny spot UV coating and they came out brill! Can’t speak highly enough of them! So, so helpful! My prints looked AMAZING, really good quality and I would definitely recommend Essential! Thank you so much! Not only are the Print Angels super professional and a pleasure to work with, they really are experts at what they do. No job role is complete without having lovely business cards to give away, and mine from Essential Print Services are just perfect. I would highly recommend the range of services offered by this company, with a huge choice of products and expert advice about choosing the best marketing materials for you and your business. The cards arrived this morning and they are looking fab and very professional! Thank you very much – great job. Can’t wait to give some cards out to people now and show them off to my colleagues..
They’ve arrived, love them! Stickers are perfect and the Business Cards are just how I wanted them. Great doing business with you again. After initially going to another printing company (mistake), whom wasted my whole day by telling me everything I’d sent was wrong and being exceptionally unhelpful (I’m no graphic designer!) so just as I was about to pull my hair out I contacted Essential Print to see if they could help and WOW what a service, sorted my cards out with no hassle and even made them look better!! Cannot recommend this place enough! Do you believe in Angels? No? Think again. I’ve spoken to them and I’ve seen them. They hang out in a lovely office in Melbourne Court and…boy…do they make your wishes come true! I’ve always known that one day I’d work with them and the day arrived when I needed to urgently call on the excellent services of Yvonne Gorman and her angelic team. They didn’t disappoint. In fact, they totally excelled and were so professional in meeting my last minute deadline that the lovely Yvonne gave up part of her weekend to get my request delivered on time. How awesome is that?! Check them out, you won’t be disappointed. Preen your wings Angels…and thank you again for an excellent service. Fantastic customer service, got my printing done in record time, and did a great job of it too. What more could you ask for from your printer? I would recommend Essential 100%! Our Wedding stationery looks amazing and we just wanted to say thank you for your help through the printing process! “Thanks again for the excellent professional service and for turning Matt’s business cards around in less than 2 hours. He was delighted and I hope I get the chance to use your services again in the future. “The cards have arrived. 🙂 Thanks for all your help with this and your positivity in business is outstanding. Should I be able to bottle and sell it I wouldn’t have to be slaving away anymore. “Thank you for your prompt and super service. The three of you are a fun group to do business with. I am more than willing to say that we have used your printing service and that I am very happy with that provided. Many thanks for the beans, nice touch! “Nothing is too much trouble for these angels!”. “I can’t wait to get all my cards sent out!”. “We always have five star service when we use Essential Print Services.”. “Thanks for turning everything round so efficiently.”. “The moral of the staff on the stand was higher than any other event due to the ease of erecting the stand and how amazing and fresh it looked.”. “I have just got off the phone from one of the staff manning the stand this week. He said that the stand was a joy to work with and stand next to. The moral of the staff on the stand was higher than any other event due to the ease of erecting the stand and how amazing and fresh it looked. So thank you both for your hard work, it really did pay off and I believe so worth the effort. “Delighted with the service we received…”. “Fantastic service, fantastic end product”. “Our fantastic new stationery arrived yesterday”. “Thank you so much for my business cards, they are very lovely. They will have their first outing tomorrow! “I have received the posters, which are of high quality. Thanks for your prompt and efficient service, and for your excellent communication throughout. I will certainly be back for more in the future. “When we needed some printing doing, several well known companies came to mind, but we decided to practice what we preach – and we enlisted the help of a local SME – Essential Print. There are several key things to note about this experience. The staff were friendly, supportive and helpful. As the ‘client’ in the situation, it was nice to talk to someone who actually knew how my printing would be done – not some person in a call centre who knew nothing more than a price to quote. Read the testimonial in full by visiting our blog. “Thank you for all of your help and guidance in getting the product boxes right. As you know this particular printing project was a really important one for my business and it was crucial that it was perfect. Thanks to Essential Print Services the boxes really are perfect! “I just wanted to say thank you for the excellent job you did on the expo graphics order you did for me recently. “Yvonne and Laura recently produced my business cards. Previously I had ordered these from a ‘faceless’ internet company. “Essential Print Services have exceeded our expectations in both service and quality…not to mention patience! Upon instructing Essential Print Services, we weren’t passed from pillar to post…Yvonne Gorman provided us initially with advice on the best and most cost-effective way to achieve our printing requirements for a bespoke item, before then providing us with a quote, sourcing the items required for printing and producing the printed documents themselves. The printed documents were of a high quality and were produced with great speed. If you would like to become one of our many happy customers, call 01332 418377 or email printangels@essentialprintservices.co.uk – we look forward to working with you soon.